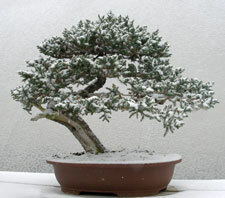 Even at its best, winter in New England is a difficult time for growing bonsai. You might be tempted to think that these are the quiet months, when in fact we are as busy as in any other season. The hobby has year round activity built into it. This is the time to catch up on projects such as wiring. 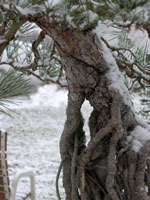 It is easier to see trunk taper and movement on deciduous trees without leaves, and it’s the only season that many of us have time for the multi-day tasks involved in wiring juniper and pines. I particularly enjoy some of the more mundane chores like cleaning the bark, wiring and detail pruning for their almost meditative qualities. When you put your trees away for the winter be sure to store the ones that need work in a ready-to-access place, to let you get at them easily and quickly. The days start to get noticeably longer almost immediately in January, and by March you can see buds swelling on most trees, including your indoor bonsai. 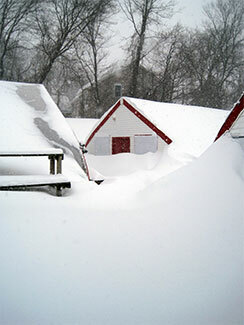 Two common problems indoors are not enough light or not enough – or too much – water. In the first case leaves begin to elongate and get weak, and in the case of drying-out leaves begin to yellow and fall off. While it is true that most of your trees aren’t drinking as much, homes tend to be drier this time of year, so try not to keep your bonsai too close to any radiators. Take a close look at your indoor trees and see how they are doing. If they aren’t growing well, move them to a sunnier window or get a good grow light. Pay close attention to insect problems, especially spider mite, scale and mealy bug; they are often hiding on the back sides of the leaves or out of sight. If you do detect insects you can use any over-the-counter plant insecticides commonly available, or spray rubbing alcohol as a preventative cure on almost all of your trees except succulents. March is the time to start fertilizing. I use liquid fertilizer once per month on all of our bonsai. At the same time, be careful not to over-feed because the days aren’t yet long enough to support vigorous growth. When the trees go out for the summer we switch to a slow-release granular food which allow the trees to absorb as much food as they want. If you are wintering your cold-hardy trees at home, check your storage place, whether garage or cold frame, for wide temperature swings. We recommend using a high/low thermometer to register the extreme night time temperatures and to make sure it’s not too warm during the day. Make sure to monitor for any rodent damage which could be devastating. 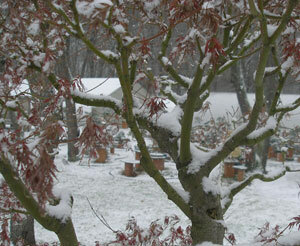 Everyone’s outdoor/cold hardy bonsai should be completely dormant, making this a great time to study their shapes and make pruning decisions for later in the year. We have found that the window for transplanting is wider than most books describe however it is always better to start early. We start transplanting our deciduous trees, including larch, maples and elms, in February and March. Next come the juniper and conifers. 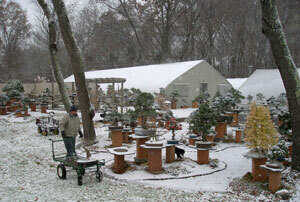 Don’t transplant tropical trees until Spring! We do this to get a jump on the season, but you can do this by watching the buds of each tree in order to catch them as they begin to swell. That is the ideal time for transplanting.